Body Stress Release works with your body’s natural desire to be stress-free. Clients are often amazed that such a gentle technique can be so effective in relieving their aches and pains. While you are lying down, fully clothed, your practitioner tests your body for stored tension. Then, by applying a gentle and precise pressure to the affected areas, your body is encouraged to ‘release’ the tension. This stored tension may be the cause of the discomfort you are experiencing including: backache, neck pain, headaches, sciatica and cramp. 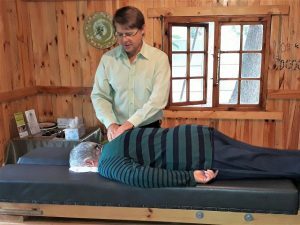 Body Stress Release is a complementary health technique that was researched and developed in South Africa in the 1980’s by Gail and Ewald Meggersee and is now practised worldwide. Our bodies are designed to adapt to these stresses in a positive way but sometimes we find ourselves overloaded by stress. In an effort to cope with this overload, the body stores the stress in the muscles. This is what we call “body stress”. Body stress can lead to pain, stiffness, postural distortion, numbness and cramp. Tension in the muscles can put pressure on your nerves which disturbs your body’s communication system. This reduces the efficiency of your body’s natural self-healing ability. How can body stress release help me? Body Stress Release is for everyone – from infants to the elderly. It is also safe during pregnancy. Clients coming for Body Stress Release are usually looking for relief from pain, stiffness or other discomfort. Clients have reported relief from back pain, sciatica, ‘slipped’ discs, headaches, migraines, neuralgia, indigestion and restricted movement. Emotional problems including insomnia, anxiety, stress, general fatigue. Gastro-intestinal complaints including heartburn, indigestion, IBS, constipation, diarrhoea. Childhood complaints including colic in babies, poor posture, growing pains in children, bed-wetting. Note: Body Stress Release is not a diagnosis or treatment of any condition. It simply assists with locating and releasing stored tension from the muscles. Responses are often rapid although further appointments may be necessary depending on the body’s response and how long tension has been stored. “I spent most of my festive season moving furniture and heavy items, as well as painting the inside of my mom’s house, which meant up and down ladders and a lot of pressure on my knees and lower back. Needless to say, even though I have always been quite physically strong, I started feeling the after affects a while later. My knees were sore, my lower back was aching and I was just generally feeling about 10 years older than I was. I kept looking at people my age and wondering why I didn’t feel like they looked. ” I have had Body Stress Release sessions with Richard Pickard-Cambridge and am amazed at how effective it has been.